Peel pears leaving stems intact. Cut 5mm off the base of each pear so they can sit upright in the saucepan. Place the pears in a small saucepan with the brown sugar, water, cardamom and vanilla bean pod. Bring to a simmer then reduce the heat to low, partially cover the pot with a lid and poach for 2 hours. Once pears are tender and golden, remove from poaching liquid and set aside. 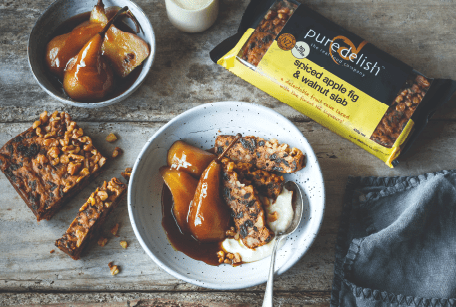 Cut pears in half and distribute between bowls, placing on slice of spiced apple fig & walnut, pour over a generous helping of syrup. Exciting news – our new pecan, ginger & coconut nograin-ola has arrived! !